Sunday 24th September. Heage and Lower Hartshay. Length & Grading: 6 miles. Moderate. (NOT in the small pub car park). Starting Point: The George Inn, 56, Main Road, Lower Hartshay, Ripley DE5 3RP. Grid Ref: SK 380 515.
canals, as well as through open countryside, towns and villages. and further information unless stated otherwise. 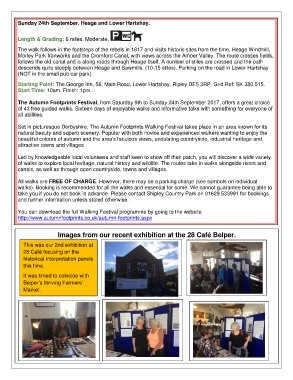 Images from our recent exhibition at the 28 Café Belper.